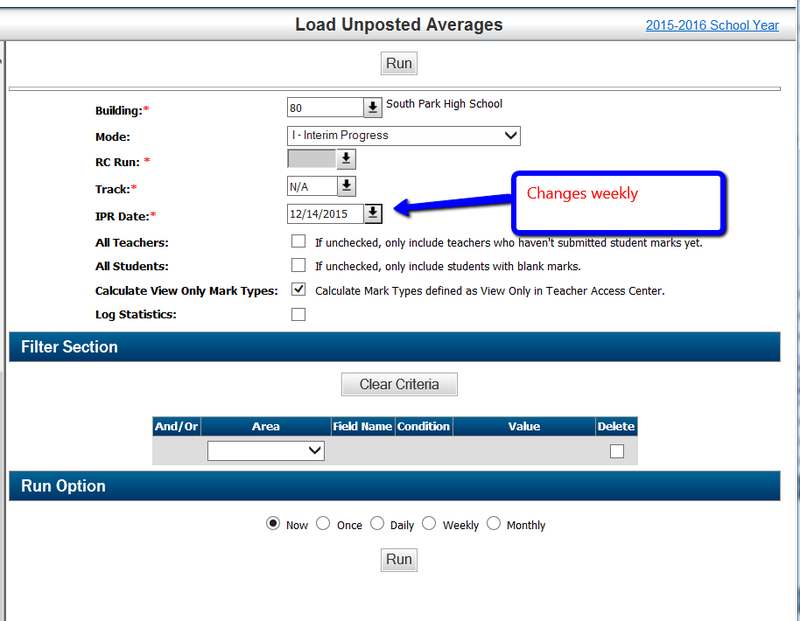 This step takes an in-the moment snapshot of teacher gradebooks. This percentage is a fixed point in time, and will not change unless you re-run this step. Interim Progress Reports are set up for the first Monday of each week during the school year. Please take care to select the correct date, or this step will fail. If school begins on a Tuesday, you may run the report on Tuesday. This step assumes that all teachers have accurately updated their grades by Friday afternoon as required. HIGH SCHOOL RUNS WITH NO FILTER DEFINED. MIDDLE SCHOOL SEE BELOW FOR FILTER. Please choose the correct building, and the correct date for the report. DO NOT CHOOSE REPORT CARD MODE ON THIS SCREEN! Since the Middle School only wants to use core classes in this calculation, the following filter is required.